Simplicity of expression, methodological specificity of appearances with journalistic specifics of quality diversity and strength of objective arguments that even for one moment does not become recognizable as arguments of power but rather the opposite - the power of the arguments. 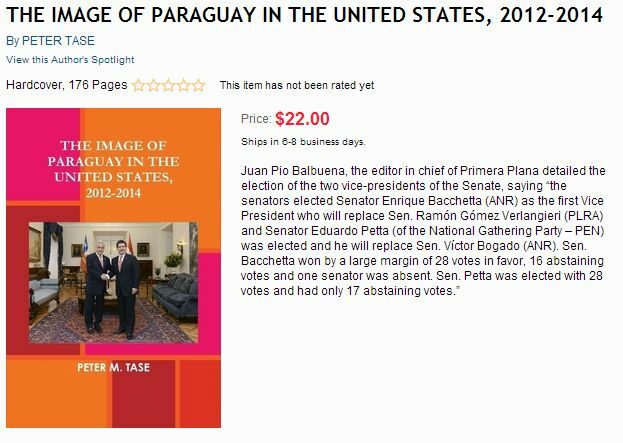 Severity analysis approach towards Paraguayan economy, its past, present, with the aim of emphasizing quality preconditions for the future is what separates this book in comparison with similar essayistic-reportage-focused analytical essays. using the phrase "the road to hell is paved with good intentions." No, this book is not only analytically precise, scientifically formulated and journalistic clarity, but may be a textbook of new generation. Journalists often tend to be a "universal ignorant" going towards the realization of "a little knowledge of everything" instead of "knowledge of specific manifestations humbly and strongly." Peter Tase belongs to the other mentioned, being the scientist who objectively, scientifically satisfactory form of answers to the essential question of HOW (? ), trying to not only ask questions, but also giving the answers on topics given to his own journalistic, analytic being. He reveals the bays of hope within the Bermuda Triangle of false assumptions, carrying himself with the thought that does not impose, but merely directs (and, is it a goal of objective journalism, scientific kind, primarily?) our considerations towards the methodology of knowledge about something, to have that "something" has become receptive to space and time on which he is focused at. And us with him; Not even for one moment the yielding to be trapped with manipulation by his own words (and thoughts of course) that it might take away, carried him away in the opposite direction, he connects incompatible indeed, connecting people, cities, regions, and countries. Why? Because of the basic, human, civilization wish to show that on the area of the world does not walk figures deluded with conspiracy theories, but the people who make civilization of the moment and who wants to live a decent life no matter where, when, how much and how they live. Of course, the question "HOW" is essential if we focus on all of the above. the capitalism that we know today lobby of the "end of history", as Fukuyama announced? Maybe we need to experience a some kind of end, catharsis in front of which is just South American area of economic potential and economic prosperity, to be able see that the answer is right in the modalities of the possible alternatives offered by this book. uses a simple formula: The formula, which is located in a reply to challenge of the above mentioned capitalist orientations. In fact, as far as we are saying that there may be an alternative to the above, there is something in which people are forced to abuse said "put somebody on power and give him money - and you will see who really he is." In the negative sense, of course; simplicity of determination of the President of Paraguay, with his associates is proving just the opposite. That man who has the power and the money does not have just always to have negative directions. Why? Due to the understanding of space and time in which he lives. Knowing that benefit for the individual brings good today and for a short time, and the common good brings benefit for a longer period of time for everybody. The fight against corruption, nepotism, thievery, manipulation, neglect, in regards paying taxes and not investing in new production processes and economic forms of improvement with the aim of achieving untaxed profit is the priority task of the President of this South American country. Of course, if he had the support of the general population. Do not forget, and this is identical in all countries of the world, the thought that we have listed about the power and money we can clearly see only as a negation of itself if we have associates who support our goal towards general-common, not towards individual good. Not long ago I wrote a thought, aphorism, "The power does not change the human. Who were jerks before he will continue to be that"; yes, this is exactly the answer to all "disbelievers". Specifically, in the case of the President of Paraguay finally confirmed the opposite, because he had not been specified within that thought, aphorism. The man who has been directed towards good in "previous" life could not otherwise do things in "today's" life. But doing good. And stay to remain identical to his own goals regardless being the ordinary citizen and / or the president. Of Paraguay. Through education reform, democratic institutions reforms, electoral system, through the rule of law and not through the law of rule, the President of Paraguay is an example of a man and a politician who wants and to do well, because all the religions of the world teaches us that "good gives...good" His presidency in the given period is not just exemplary of the leadership of the country, not only for his own space and time, but also more widely, and beyond. 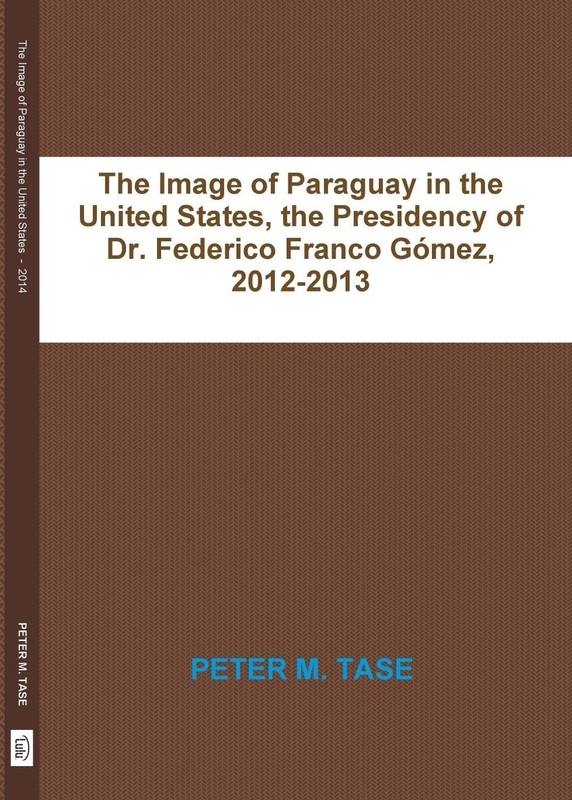 Peter Tase, through this occasion gives us the view from the USA towards the pragmatic President willing to confront serious problems in the country and being ready to do something more than just to execute the mandate of President-puppet, and often ends up on the political trials, as his predecessors. To this president that could not happen. Transparency was his brutal, but honest answer. The answer that confuses enemies and makes friends where you least expect. In a direct conversation through interview with the President of Paraguay, Peter Tase, skillfully brave scholar interview leads to a genuine encounter with the truth - oriented quality of living for the people, but also for the country as a whole. Aimed towards political and economic evolution which might only appear as it is with missing the letter "r" at the beginning of word, the president of Paraguay with his practicality concreteness turns to be serious - environment in which he exists. Cooperation with neighboring countries, the European Union, USA and all those who seek common interests where everybody wins (win-win situation) with a view to the welfare of all for all and not some for individual someone-or several of them, is the basic goal of presenting the life and way of work of this man. President. Small, but a great country; multilingual approach of launching of this journalists-essayistic-reportage kind of the work is another benefit of the author. And he succeeds in doing that, bringing seemingly distant languages to other people, and vice versa. Although he explains in details the meetings of the President of this country with other officials of the neighboring countries and beyond, overseas friends, not for one moment we find no excess of condescending that owns "house" journalists but on the contrary, we have the "discoverer" of the truth in front of us. These high quality strongly substantiated truth about time and space and the impact of one man in space and time in which he lives. And works. Aspiring towards good. 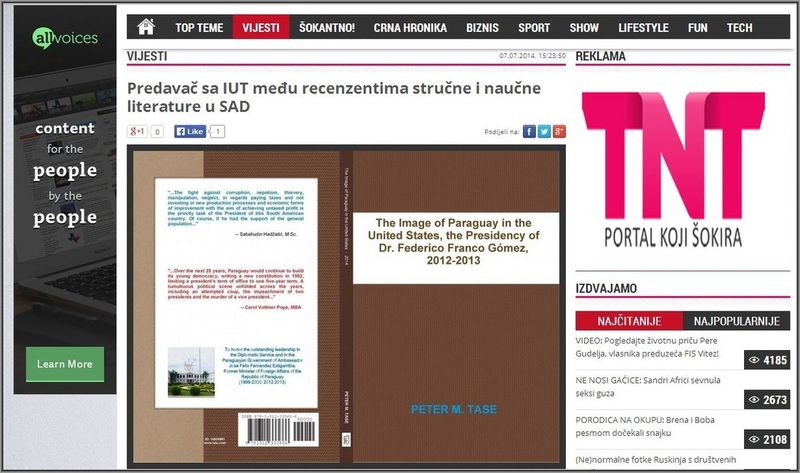 Writing texts of essayistic origin in EURASIA REVIEW and SPERO NEWS during the period covered by this book, Peter Tase presented the consistency of his vision without departing from the basic assumptions of journalistic craft. Of what? Precisely what many journalists are missing makes this author a gifted writer. What is it? Through cinematic framing of the specific news and developments before us spreads a beautiful rug of the facts, argumentative attitudes, wise conclusions, and recommendations. Focus on the man about he writes, talks to him, but also using the most valuable thing that makes a man a human - aspiring towards the truth. Although we are all determined by the environment where we grow up, through education, the influence of tradition, religion, race, gender, etc., before us appears the author does not abuse these influences but, on the contrary, took advantages of them and skillfully uses it to be able to give us a man of different area and the environment. Peter Tase advantage is that he is a man without prejudice, open and focused to the implementation of methodology of realization of understanding that we are humans on the first place, and after that specially designated national; religious and/or traditional forms of appearance. Multi-identity that exists within the author of this book is an advantage in a world filled with faults exclusion, hatred and prejudices. His writing is a symbolic reflection of the artist of words in the face of angry everyday life which he reveals frankly, inspired and skillfully. With focuses even on the tiniest detail when talking about dates, places and people. In and around them. Opening of the perspectives for the general awareness of the world in and around Paraguay, this author has created a better understanding of ourselves as well. Because understanding the other, we are creating preconditions for better understanding of the own acts and actions. Contradictio in adiecto? No, just the opposite. This book is an example of that. It teaches us. Creating a textbook of knowledge. About the space and time. Having the good fortune to be a contemporary of time and space about which he is writing, Peter Tase reveals for us the truth in its fullness. Through the concreteness, with the power of the argument in the fight against gray of obedient journalism, while understanding that it is a difficult time in front of a single man, but he knows what he's doing. Again, aspiring towards good. With a focus on specific forms of economic orientations of the MERCOSUR region as the "breadbasket of the world" - the Common Market of South America where everybody wins with a view for the development and survival of each of the Member States on the basis of equality, this journalist and scholar does good. And not only about that, but on tourism, cooperation with other countries, regions, economic unifying own orientations. Speaking of the essence because of the concrete forms of implementation. World being targeted. Being conscious with historical facts, in his writings is possible to see the reflection of seeing of a human, and after that only journalists and scholar, who devoted his direction to the country that is not of his origin, but his determination. Knowing that the longest journey begins with the first step. And when we talk about awakening of the humans, people, countries. But also us about them. And about us, ourselves. Within the collaboration with colleague Martin Barillas also in a number of texts of this book. As I said, film framing of Peter Tase before us creates a documentary vision of people and acting in one country for me, as a European, so far away, but after reading this book, so close to me. Especially when we talk about everyday life in Paraguay within the economic, political and social problems which are faced with. Surrounded by a large fish to whom is not enough to limit them the habitat but already want to deny even themselves. My dear Bosnia and Herzegovina, the land of the Serbs, Croats, Muslims, but most of all of all Bosnians and Herzegovinians, is it happens to you as well for centuries? Paraguay is a country that respects tradition through shaping Guarani language as a promotional form of survival of the culture and tradition due to the fact that this is the only official indigenous language in South America that is used in official communications. Peter Tase stayed, in the form of these presentations, remained consistent to himself, opening new doors of understanding for the culture of the country in the survival, pride and unity. As I began this story of a human - a writer, journalist, I will finish in the same way: Simplicity of expression, methodological specificity of appearances with journalistic specifics of quality diversity and strength of objective arguments that even for one moment does not become recognizable as arguments of power but rather the opposite - the power of the arguments. Why I am repeating the introductory sentence. Because the announcement has confirmed discussed above. And it is worth. The power of the arguments; of Peter's. 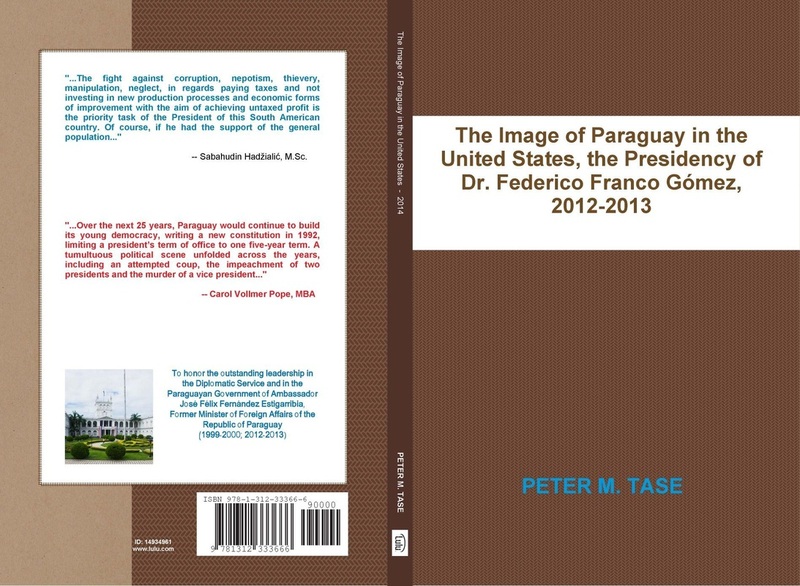 “The Image of Paraguay in the United States, the Presidency of Dr.
the permission in writing from the publisher. Jednostavnost izričaja, metodološka konkretnost pojavnosti uz iskrenost žurnalističke osebujnosti i snage objektivnih argumenata koji ni jednoga trenutka ne postaju prepoznatljivim kao argumenti snage već upravo suprotno - snaga argumenta. Ozbiljnost pristupa analizi Paragvajske ekonomije, njene prošlosti, sadašnjosti sa ciljem ukazivanja na kvalitetne pretpostavke budućnosti je ono što izdvaja ovu knjigu u poređenju sa sličnim esejističko-reportažno-analitički fokusiranim esejima. In medias res: Knjige sličnih uobličenja nerijetko imaju za cilj pretpostavku manipulativne akcije, ciljane želje da vapajem za određenim oblicima ekonomskih određenja otvaraju vrata sunovrata, koristeći rečenicu „put u pakao je popločan dobrim namjerama“. Ne, ova knjiga ne samo da je analitički koncizna, naučno uobličena i žurnalistički jasna, već može biti udžbenikom novih generacija. Novinari nerijetko znaju biti „univerzalne neznalice“ idući ka realizaciji „znanja svega pomalo“ umjesto „znanja konkretnih pojavnosti smjerno i snažno“. Peter Tase pripada ovim drugim, bivajući naučnikom koji objektivno, zadovoljavajući naučno formu odgovora na suštinsko pitanje KAKO (? ), pokušava ne samo postavljati pitanja, već davati i odgovore na teme zadate vlastitom novinarskom, analitičkom biću. On otkriva zalive nade unutar bermudskog trougla lažnih pretpostavki noseći se mišljom da ne nameće, već samo usmjerava (zar i to nije cilj novinarstva, naučnog, prije svega?) naša promišljanja ka metodologiji znanja o nečemu, kako bi to „nešto“ postalo prijemčivo u prostoru i vremenu na koji je fokusiran. I mi sa njime. Ni jednoga trenutka ne popuštajući zamci manipulacije od strane vlastitih riječi (i misli, naravno) koje bi ga mogle odvesti, zanijeti u suprotnom pravcu, on spaja nespojivo itekako, povezujući ljude, gradove, regije, ali i zemlje. Zbog čega? Zbog osnovne, ljudske, civilizacijske želje da pokaže da prostorom svijeta ne hodaju brojke zavedene teorijama zavjere, već ljudi koji čine civilizaciju trenutka koji žele živjeti životima dostojnim čovjeka bez obzira gdje, kada, koliko i kako žive. Naravno, pitanje „kako“ je suštinsko kada se fokusiramo na sve navedeno. Odgovori se nalaze u knjizi Petera Tase, naravno, ako znamo čitati. Ne između redova, jer on nije od te vrste autora koji zadaju muke urbi et orbi kada čitaoci glavu razbijaju pitanjem „šta je pisac želio reći“, već direktno raščlanjujući pojavno i, sklapajući ga ponovno u analitičke oblike mogućih vizija. Saradnje, nadgradnje i realizacije. Privrede, u svim njenim oblicima. Pojavnosti. Živimo u nesavršenom svijetu. Svijetu gdje bogati imaju sve više a siromašni sve manje. U svijetu kapitalizma koji je nadvladao moguće alternative uobličene u socijalizmu u vijeku iza nas. Ali, da li je kapitalizam koji danas poznajemo predvorje „kraja istorije“ kako je to Fukujama najavljivao? Možda i trebamo doživjeti svojevrsni kraj, katarzu pred kojom je upravo južnoameričko područje privrednih i ekonomskih mogućih prosperiteta, kako bi uvidjeli da je odgovor upravo u modalitetima mogućih alternativa koje nudi ova knjiga. Kako? Vražje pitanje se ponovo otvara pred nama. Odgovor je, kao i uvijek, bolno jednostavan. Peter Tase, kada analizira usmjerenost želje predsjednika jedna male (po prostoru, ljudima i do određene mjere ograničenim resursima), ali velike (po usmjerenjima, realizacijama, težnjama) zemlje kao što je Paragvaj, on koristi jednostavnu formulu: Formulu koja se nalazi u odgovoru izazova gore navedenih kapitalističkih usmjerenja. Naime, koliko god govorili da može postojati alternativa navedenom, postoji nešto u ljudima što ih goni da zloupotrijebe rečeno „daj čovjeku vlast i novac i vidjećeš kakav je“. U negativnom smisli, naravno. Jednostavnost određenja predsjednika Paragvaja, sa njegovim saradnicima, je upravo dokazivanje suprotnog. Da čovjek koji ima vlast i novac ne mora baš uvijek imati negativna usmjerenja. Zbog čega? Zbog razumijevanja prostora i vremena u kojem živi. Znajući da pojedinačna korist donosi dobro danas i na kratko vrijeme, a opće dobro donosi korist za duži vremenski period svima. Borba protiv korupcije, nepotizma, lopovluka, manipulacije, zanemarivanja plaćanja poreza i ulaganja u nove proizvodne procese i ekonomske oblike unapređenja sa ciljem ostvarivanja neoporezovane dobiti je prioritetni zadatak predsjednika ove južnoameričke zemlje. Naravno, ako bude imao podršku šire populacije. Ne zaboravimo, a to je istovjetno u svim zemljama svijeta, misao koju smo naveli o vlasti i novcu tek možemo jasno vidjeti kao negaciju sebe samo ako imamo saradnike koji podržavaju naša usmjerenja općem, a ne pojedinačnom dobru. Ne tako davno sam napisao misao, aforizam „Vlast ne mijenja čovjeka, papak ostaje papak.“ Da, upravo je to odgovor svim „nevjernim Tomama“. Naime, u slučaju predsjednika Paragvaja se konačno potvrdilo suprotno, jer on nikada i nije bio navedeno. Čovjek usmjeren dobrom u „prijašnjem“ životu i nije mogao drugačije raditi stvari u „današnjem“ životu. Do činiti dobro. I ostati istovjetan vlastitim ciljevima bez obzira bio običan građanin i/ili predsjednik. Paragvaja. Kroz reforme obrazovanja, demokratskih institucija, izbornog sistema, vladavine prava a ne prava vladavine, predsjednik Paragvaja je primjerom čovjeka i političara koji želi činiti i raditi dobro, jer kako nas o tome i sve religije svijeta uče: „dobro, dobro daje“. Njegovo predsjednikovanje u datom periodu je egzemplarom vođenja zemlje ne samo za vlastiti prostor i vrijeme, već i mnogo šire, i dalje. 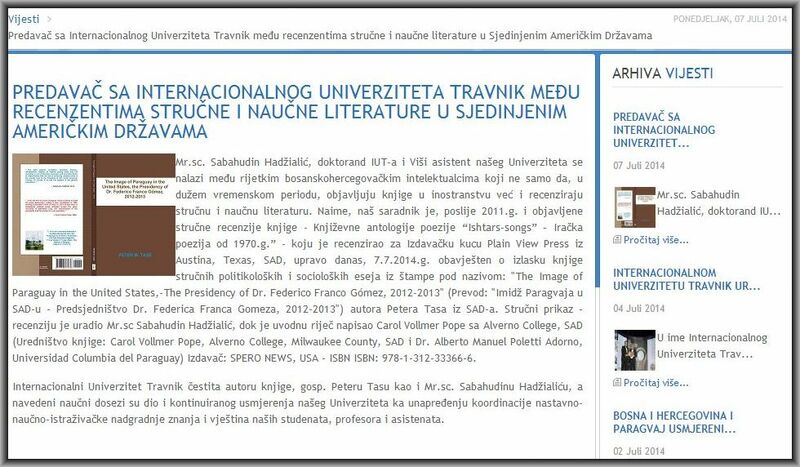 Peter Tase nam ovom prilikom daje pogled iz USA prema pragmatičnom predsjedniku spremnom na suočenje sa ozbiljnim problemima u državi spremnim da učini nešto više do samo da odradi mandat predsjednika-lutke, a nerijetko završi i na političkim suđenjima, kao njegovi prethodnici. Ovom predsjedniku se to nije moglo desiti. Transparentost je njegova surov, ali iskren odgovor bio. Odgovor koji zbunjuje neprijatelje, a stvara prijatelje gdje je to najmanje očekivao. U direktnom razgovoru sa predsjednikom Paragvaja, Peter Tase, umješnošću vrlog znalca vodi intervju ka iskrenom susretu sa istinom – usmjerenom kvalitetnijem življenju naroda, ali i države u cjelini. Usmjeren političkoj i ekonomskoj evoluciji koja možda samo naizgled to jeste uz nedostajuće slovo „r“ na samom početku riječi, predsjednik Paragvaja svojom konkretnošću uozbiljuje okruženje u kojem egzistira. Saradnja sa zemljama okruženja, Evropskom Unijom, USA i svima onima koji teže zajedničkim interesima gdje svi dobijaju (win-win situacija) sa ciljem dobrobiti svih za sve a ne jednih za nekoga-pojedinca ili više njih, je osnovni cilj predstavljanja lika i djela ovog čovjeka. Predsjednika. Male, ali velike zemlje. Multilingvistički pristup predstavljanja ovog žurnalističko-esejističko-reportažnog autorskog djela je još jedna prednost autora. I uspijeva u tome, približavajući naizgled udaljene jezike drugim ljudima, i vice versa. Iako u detalje opisuje susrete predsjednika ove zemlje sa drugim dužnosnicima zemalja okruženja i šire, prekomorskih prijatelja, ni jednoga trenutka ne nalazimo višak snisholjivosti koji posjeduju „kućni“ novinari već upravo suprotno, pred nama je „razotkrivač“ istine. One kvalitetne, snažno argumentovane istine o vremenu i prostoru i uticaju jednog čovjeka na prostor i vrijeme u kojem živi. I radi. Dobru stremeći. Pišući tekstove esejističke provenijencije u EURASIA REVIEW i SPERO NEWS tokom perioda koji obuhvaća ova knjiga, Peter Tase je predočio konzistentnost svojih vizija ne odstupajući od osnovnih pretpostavki novinarskog zanata. Čega? Upravo onoga što mnogim novinarima nedostaje, čini obdarenim ovoga autora. Šta je to? Kroz filmsko kadriranje konkretnih vijesti i pojava, pred nama se razastire predivan tepih činjenica, argumentovanih stavova, mudrih zaključaka, i preporuka. Usmjerenost čovjeku o kojem piše, razgovara sa njim, ali i koristeći ono najvrijednije što bi trebalo činiti čovjeka, čovjekom – istini stremeći. Iako smo svi mi predodređeni okruženjem odrastanja, obrazovanja, uticaja tradicije, vjere, rase, gendera i sl., pred nama se pojavljuje autor koji ne zloupotrebljava te uticaje već se, dapače, vješto koristi njima kako bi nam približio čovjeka drugog prostora i okruženja. Prednost Petera Tasa je da je čovjek bez predrasuda, otvoren i usmjeren metodologiji realizacije shvatanja kako smo ljudi na prvom mjestu, a iza toga posebno određeni nacionalni, vjerski i/ili tradicionalni oblici pojavnosti. Multidentitet koji u autoru ove knjige egzistira je prednost u svijetu ispunjenog manama isključivosti, mržnje i predrasuda. Njegovo pisanje je simbolična refleksija umjetnika riječi u susretu sa ljutom svakodnevnicom koji razotkriva iskreno, nadahnuto i znalački. Fokusiran je i na najsitniji detalj, kada govori o datumima, mjestima i ljudima. U i oko njih. Otvarajući perspektive široj informiranosti svijeta u i oko Paragvaja, ovaj autor je stvorio pretpostavke boljeg razumijevanja i nas samih. Jer razumijevajući druge, stvaramo pretpostavke boljeg i kvalitetnijeg razumijevanja i vlastitih postupaka. Contradictio in adiecto? Ne, Upravo suprotno. Ova knjige je primjer tome. Uči nas. Kreirajući udžbenik saznanja. O prostoru i vremenu. Imajući sreću da bude savremenikom vremena i prostora o koje piše, Peter Tase nam razotkriva istinu u svoj svojoj punini. Konkretnošću, snagom argumenta u borbi protiv sivila poslušnog žurnalizma, istovremeno razumijevajući da je težak put pred jednim čovjekom, ali da zna šta radi. Ponovo, dobru stremeći. Sa fokusom na konkretne oblike ekonomskih usmjerenja MERCOSUR regije kao „svjetske košare hljeba“– zajedničkog tržišta Južne Amerike gdje svi dobijaju sa ciljem razvoja i opstanka svake od država članica na ravnopravnim osnovama, i ovaj novinar i naučnik čini dobro. I ne samo o tome, već o turizmu, saradnji sa drugim zemljama, regijama, ekonomski objedinjujući vlastita usmjerenja. Govoreći o suštini radi konkretnih oblika realizacije. Svijetu bivajući usmjerenim. Istorijskim faktima osvješten, u njegovim tekstovima se vidi odsjaj viđenja čovjeka, a tek iza toga novinara i naučnika, koji je svoja usmjerenja posvetio zemlji ne svoga porijekla, ali određenja. Znajući da i najduži put počinje prvim korakom. I kada govorimo o osvještenju ljudi, naroda, država. Ali i nas o njima. I nama, samima. Unutar i saradnje sa kolegom Martinom Barillasom u jednom broju tekstova ove knjige. Kako rekoh, filmsko kadriranje Petera Tasa pred nama kreira dokumentarnu viziju ljudi i djela u jednoj zemlji meni, kao Evropljaninu, toliko dalekoj, ali poslije čitanja ove knjige, toliko bliskoj. Posebno, kada govorimo o svakodnevnici Paragvaja unutar privrednih, političkih i društvenih problema sa kojima se suočava. Okružena velikim ribama kojima nije dovoljno što im ograničavaju obitavalište već žele i negirati njih same. Bosno i Hercegovino, zemljo Srba, Hrvata, Muslimana, ali prije svega Bosanaca i Hercegovaca, zar se to i vama ne dešava stoljećima, vjekovima? Paragvaj je zemlja koja poštuje tradiciju uobličavajući jezik Guarani kao promotivni oblik opstojnosti kulture i tradicije radi činjenice da je to jedini zvanični domaći jezik u Južnoj Americi koji se koristi u zvaničnoj komunikaciji. Peter Tase je i u obliku ovakve prezentacije ostao dosljedan sebi, otvarajući nova vrata razumijevanja kulture zemlje u opstanku, ponosa i jedinstva. Kao i počeh ovu priču o čovjeku – piscu, novinaru, naučniku, i završiću je: Jednostavnost izričaja, metodološka konkretnost pojavnosti uz iskrenost žurnalističke osebujnosti i snage objektivnih argumenata koji ni jednoga trenutka ne postaju prepoznatljivim kao argumenti snage već upravo suprotno - snaga argumenta. Zbog čega ponavljam uvodnu rečenicu? Jer je najava potvrdila navedeno u tekstu. I vrijedi. Snaga argumenta. Peterova.